Chris Cutrone’s recent article “Lenin’s Liberalism” (Platypus Review #36) claims that Lenin’s politics are distorted when characterized as a pure opposition to bourgeois conditions. In fact, he suggests that Lenin insisted on “the mediation of politics in society” even after the creation of a “workers’ state,” demonstrating a liberal desire to preserve certain features of bourgeois society. His use of Lenin’s theory regarding the continuation of “bourgeois right” betrays an inattention to the context of Lenin’s remarks, and the notion that Lenin applied a liberal perspective to the question of working class political power does not ring true. The essay seems to conjure an ideal Lenin that can more readily be used as a reference point for contemporary Marxism. Cutrone’s claim that Lenin sought to “fulfill the desiderata of bourgeois society” rests on a strategy of non-confrontation with the messy historical details of Lenin’s relationship with liberal political ideals. In this response, I will appraise the content of Lenin’s liberalism in more concrete terms, particularly the claim that Lenin’s notion of the persistence of “bourgeois right” in socialism undergirds his belief in “an articulated non-identity of state, political parties, and other voluntary civil society institutions such as labor unions.” We will see that the notion of “bourgeois right” is not evidence of a liberal perspective in Lenin, and that within Lenin’s discussion of socialist transition it supports an understanding of the state as an economic actor, not as the site of political mediation. Then I will show how the liberalism ascribed to Lenin is largely mythical in light of his political practice in the context of a so-called “workers’ state.” In the early Soviet state, the imperatives of economic construction and the management of power led Lenin both to a more radical rejection of liberal values in politics, as well as a reinforcement of bourgeois relations in production. While I reject Cutrone’s expansive interpretation of Lenin’s liberalism, there are other, more restrictive reasons for calling Lenin a liberal. Lenin elaborates the idea of “bourgeois right” in The State and Revolution (1917), while discussing Marx’s Critique of the Gotha Program , where the phrase “bourgeois right” is used. In that text, Marx describes two phases of communist society that follow the transformation of capitalism into communism. The first phase of communist society is characterized as one that has just emerged out of capitalism, while the “higher phase” develops on the basis of communist society itself. The distinguishing feature of the first phase of communism is that individual consumption is linked to labor expended in production. The individual producer “gets from society a receipt that he has contributed such and such an amount of labor (after a deduction of labor for common reserves) and withdraws from society’s stores of the means of consumption an equal amount costed in labor terms.”1 This is a communist society, a “co-operatively organized society based on common ownership in the means of production,” in which the labor expended on products does not appear “as the value of these products.”2 Nonetheless, insofar as the common standard of labor expenditure is applied to all, the equal right of the producers “is still—at least in principle—a bourgeois right,” according to Marx.3 It is a bourgeois right because only in bourgeois society does the notion of abstract human equality, and thus the application of a common standard of justice to all people, become prevalent. In the context of Marx’s text, however, the notion of “bourgeois right” has little connection with the mediation of politics in society. Marx writes of the “limited horizon of bourgeois right,” and describes how equal right on the basis of labor leads to inequalities due to the different needs and abilities of the producers.4 Lenin describes this “equal right” as “a violation of equality and an injustice.”5 He describes how communist society “is compelled to abolish at first only the ‘injustice’ of the means of production seized by individuals,” and is unable “to eliminate the other injustice, which consists in the distribution of consumer goods ‘according to the amount of labor performed’ (and not according to needs).”6 It is worth noting that the distribution of consumer goods “according to the amount of labor performed” is not a feature of capitalism, as Lenin implies. In a capitalist society, workers sell their labor-power in exchange for wages. The wages they receive, and thus the consumer goods they are able to acquire, do not have a direct connection with the amount of labor they perform, which would be the case in Marx’s conception of the first phase of communism. Instead of an exchange of commodities, as in capitalism, the first phase of communism features a conscious social organization of production, replacing the capitalist opposition between the producers and the conditions of production. As Marx wrote in Capital, in such a society “the social relations of the individual producers, both towards their labor and the products of their labor, are here transparent in their simplicity, in production as well as in distribution.”7 Lenin does not clearly distinguish the relation of the producers to their labor and their products in capitalism from this relation in socialism. Lenin therefore imagines that the concept of “bourgeois right” describes a determinate social relation that persists throughout the change from capitalism to communism. This socialist apparatus, with a bourgeois state run by armed workers at its center, extends a certain factory discipline to the whole of society.18 Lenin’s understanding of “bourgeois right” leads him to see the “bourgeois state without the bourgeoisie” as an enforcer of equality and equal rights in production. It does not, contra Cutrone, lead to a liberal political perspective, or any notion of independent political parties whatsoever, despite the fact that the phrase “bourgeois right” sounds exceedingly liberal. Since it is the workers’ state that ends up enforcing “bourgeois right,” the liberal virtues of this state depend fundamentally on how the workers’ state is conceived. 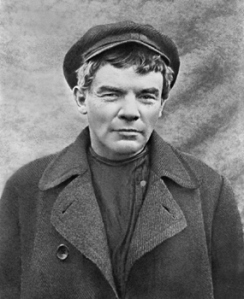 In The State and Revolution, Lenin supports the idea of a vanguard party assuming power and “directing and organizing the new system.”19 By Cutrone’s standards, this vision is discontinuous with the liberal tradition: he claims that, “the articulation of [political parties] with political power struck classical liberal thinkers as particularly dangerous.”20 If such a vanguard party enforces something called “bourgeois right,” this does not make it any more liberal. While the trade unions were supposed to play an educational role, the party was to have authority in industry until the time when the workers become capable of self-management. During the trade union debate, Lenin stigmatized the “syndicalist deviation” of those who wanted the unions to take on managerial functions. “Why have a Party,” Lenin asked in January 1921, if industrial management is to be left to the trade unions, “nine-tenths of whose members are non-Party workers?”33 It is here, in the relation between the workers and their work—and not in regard to the function of a political party—that Lenin could be said to be a liberal. In a December 1920 speech on the trade union question, Lenin made a decidedly liberal argument as well, denouncing the slogan of “industrial democracy”: “Democracy is a category proper only to the political sphere,” he insisted.35 The liberal assumption is that democracy is rightfully restricted to the sphere of politics, while the workplace is governed by purely economic imperatives. Lenin’s liberalism, to the extent that it exists after the October Revolution, is not the sort that Cutrone imagines. On the basis of an understanding of socialist transformation as nationalization, Lenin was able to reconcile the task of economic development on the backs of the workers with the idea of proletarian dictatorship. In this theoretical universe, an incredible amount of weight was put on the correct politics of the ruling party, the minority that was actually implementing this proletarian dictatorship. In this way, a certain preservation of bourgeois conditions was coupled with a decidedly illiberal narrative regarding the just dictatorship of a party that had “merged” with the masses. 1. Karl Marx, “Critique of the Gotha Program,” in Later Political Writings (Cambridge: Cambridge University Press, 2010), 213. 5. V. I. Lenin, “The State and Revolution,” in The Lenin Anthology, Robert C. Tucker (New York: Norton, 1975), 376. 7. Karl Marx, Capital: A Critique of Political Economy (London: Penguin, 1990), 1: 172. 8. Lenin, The State and Revolution, 378. 10. Paresh Chattopadhyay, “The Economic Content of Socialism: Marx vs. Lenin,” Review of Radical Political Economics 24, no. 3&4 (1992), 108. 11. Lenin, The State and Revolution, 383. 17. Lenin, “Can the Bolsheviks Retain State Power?” in The Lenin Anthology, 401. 18. Lenin, The State and Revolution, 383. 20. Chris Cutrone, “Lenin’s Liberalism,” Platypus Review #36 (June 2011). 21. V. I. Lenin, “Political Report of the Central Committee of the R.C.P. (B. ),” in Collected Works, vol. 33 (Moscow: Progress Publishers, 1966), 278. 22. V. I. Lenin, “Speech at the First All-Russia Congress of Workers in Education and Socialist Culture,” in Collected Works, vol. 29 (Moscow: Progress Publishers, 1965), 535. 23. Lenin, “Left-Wing” Communism—An Infantile Disorder, in The Lenin Anthology, 567. 24. Lenin, “Speech at the First All-Russia Congress of Workers in Education and Socialist Culture,” 534. 25. Simon Pirani, The Russian Revolution in Retreat, 1920-24: Soviet Workers and the New Communist Elite (New York: Routledge, 2008), 100-101. 27. V. I. Lenin, “Letter to the Workers and Peasants Apropos of the Victory Over Kolchak,” in Collected Works, vol. 29 (Moscow: Progress Publishers, 1965), 559. 28. Hal Draper, The “Dictatorship of the Proletariat” from Marx to Lenin (New York: Monthly Review Press, 1987), 100-101. 29. Lenin, “Left-Wing” Communism—An Infantile Disorder, 573. 30. V. I. Lenin, “The Role and Functions of the Trade Unions Under the New Economic Policy,” in Collected Works, vol. 33 (Moscow: Progress Publishers, 1966), 193. 33. V. I. Lenin, “The Party Crisis,” in Collected Works, vol. 32 (Moscow: Progress Publishers, 1965), 50. 34. V. I. Lenin, “Speech Delivered at the Third All-Russia Congress of Water Transport Workers,” in Collected Works, vol. 30 (Moscow: Progress Publishers 1977), 426-427. 35. Lenin, “The Trade Unions, the Present Situation and Trotsky’s Mistakes,” in Collected Works, vol. 32 (Moscow: Progress Publishers, 1965), 26. Is David Adam from the SPGB? I think he doesn't understand that Lenin didn't believe socialism was possible in (relatively) backward Russia, hence Lenin consciously was striving for state-capitalism. So Lenin was a good old Marxist, meaning he knew that the conditions limit what is possible, and the stage Russia was going to go through, as Lenin argued decades prior, was capitalism and not socialism. I think Cutrone should also be careful not to confuse this, but he's right that as a Marxist, Lenin was a liberal in the sense that Engels can be said to be a liberal. Man sieht, es wird dem Staat im Grunde eine nur transitorische, zeitweilige Rolle zuerkannt, die wesentlich die einer unterdrückenden oder niederhaltenden Gewalt ist – also das, was Lassalle gerade die Rolle eines Nachtwächters der jeweilig herrschenden Klasse nennt, und wenn mit dem Bestehen verschiedener Gesellschaftsklassen die Klassengegensätze und der Anlaß zur Niederhaltung von Klassen aufhören, hört nach dieser Theorie auch der Staat auf. Sie zieht sich durch alle Schriften von Marx und Engels und ist von letzterem später in der Schrift: Der Ursprung der Familie, des Privateigentums und des Staates näher begründet worden. No, I'm not from the SPGB, and not really influenced by them either. When you say that Lenin saw the necessity for some sort of capitalist development (given Russian conditions), I can only agree. Lenin's appeal to the example of liberal capitalism is highlighted in the above article. I have to say, I think it is very clear that I was taking issue with the characterization of Lenin as a liberal specifically with regard to the mediation of politics in society, and the idea of competing political parties, etc. iirc Lenin was speaking very specifically against the coalition with the left-SR (because with the struggle in the countryside they became a petty-bourgeois party) - but just the fact that there was such a coalition in the beginning stage of the revolution shows Lenin's liberalism I guess. Not only did Lenin believe that the Bolshevik party in some sense “merged with the working class,” but he also berated the German Left for the “most incredibly and hopelessly muddled thinking” in distinguishing between party dictatorship and class dictatorship. I don't think Stalin ever supported the German Left, but here he does correctly defend Lenin's views. I could give more citations of Stalin (around 1923-24), on the non-identity between state and party, state and proletariat, etc. Well, I think that Stalin's words should be taken with more than a grain of salt. The idea of the Soviets implementing the dictatorship of the proletariat, and not the party alone (and therefore the absurdity of identifying them) is entirely compatible with what most people would consider party dictatorship, given the repression of dissent and the restriction of freedom of the press. Is the point Lenin was making against the German Left very obscure? Is it utterly trivial? My interpretation of it, according to which Lenin identified the interests of the working class with the party, and for this reason rejects the distinction between party dictatorship and class dictatorship, is fairly straightforward, and consistent with lots of the things Lenin said, some of which are in the article. I don't see how Stalin helps us interpret Lenin here. Stalin only appears to respond to the issue at hand. Some distinction between party and Soviet organs is quite obviously compatible with single party rule of Soviet organs. On Chattopadhyay: he is entirely clear that a state would exist while capitalist social relations exist. It is Lenin who writes about a state in Marx's first phase of communism, when capitalist social relations have supposedly been abolished. Wasn't that clear from the article? The idea (which Chattopadhyay attributes to Lenin and ridicules) that the working class recreates a bourgeois state is clearly described by Chattopadhyay as taking place after the transition to communism. I actually questioned whether this is the best interpretation of Lenin, but this has nothing to do with any incomprehension of "Marxism 101." Stalinists did not so much claim the merger/identity of party, state and society as enacted it in practice. In fact, in theory, they claimed the non-identity of party, state and society, and claimed indeed that the party was in constant war with "capitalist-roaders" in both the state and society -- as well as within the party itself, i.e., against those who were supposedly "subjectively revolutionary" but "objectively counterrevolutionary" (e.g., "Trotskyites," et al.). But anti-Stalinists, i.e., "anti-authoritarians," "liberals," "anarchists," and others, also either claim or politically enact the identification/merging/conflation of political party, state and society. For instance, it is a common mistake to interpret Lenin's argument for party organization as a model for the state or even society as a whole, which it was not. Or, there is the mistaken modeling and application of "democracy" to all domains of life, as in Michael Albert's Parecon. But this violates concrete realities -- and how they might be changed. I think that Lenin, by contrast, thought that the issue of potential social emancipation was a matter of political contestation and not a priori certainty. I think that Lenin was not dogmatically authoritarian like Stalin and others, but political, which is different. Everyone believes that they have a correct and legitimate perspective. Stalin probably believed sincerely that he was following Lenin in most important respects. So Stalin's words must be "taken with a grain of salt" -- as do Lenin's, of course! We should never simply take people at their word, but interrogate matters further. My point, in the article I wrote to which David Adam responded (which I presented at the Left Forum 2011 in New York and at the Marxist Literary Group's summer 2011 Institute on Culture and Society) and for which I published a rejoinder, is to call attention to the relation between Lenin's thought and action, which I consider to express perspectives that have become obscured, repressed and forgotten in subsequent history and so potentially stand in need of recovery. Perhaps others can maintain that there's not anything more to Lenin than what they already think. I was pointing to indications that there is more to Lenin as a historical figure, from which a present critical approach to Marxism could learn. Is it just me or does anyone else find discussion of Lenin on libcom to be a bit gross? Agreed... Yet another "look at Lenin". Lenin's "novelty" was combining Kautskyism and Blanquism into a political organization to seize and consolidate State power in a period of insurrectionary class conflict. Another eulogy, or debate about the historical specifics, for how fascinating it was to combine the two tendencies of that era of the Left which were the most elitist and disdainful of the potentialities for the working class to liberate itself; seems out of place on a forum devoted to libertarian communism.